Bill Myers is a bestselling author and award-winning writer/director whose work has won forty national and international awards. 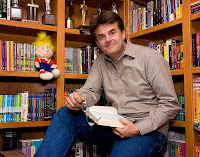 His books and videos have sold eight million copies and include such titles as The Seeing, Eli, The Voice, My Life as…series, and McGee and Me. Zach Dawkins headed for the schools. “Schools” as in the high school, junior high, and elementary school that were all lined up side by side on the same street. “Death Row,” he called it. Zach was pretty good looking—sixteen with dark hair that stuck out in so many directions it looked like it got cut by a lawnmower gone berserk. It’s not that Zack was sloppy … he just had better things to do than worry about his looks—especially when he was late for school, which was like every day. Zach wasn’t exactly the responsible type. Unfortunately, Piper, his thirteen-year-old sister, was. It seemed her job was to remember everything Zach and the rest of her family forgot. Like her brother, she was good-looking (though you couldn’t convince her of that). She had these chocolate brown eyes that were incredible … but you had to work hard to find them beneath all that hair she hid under. Piper was a bit on the self-conscious side. As usual, six-year-old Elijah dragged behind them. Nothing new there. The guy was always lost in his own world and he hardly, if ever, talked. Piper loved him fiercely and she always looked out for him. But there was no getting around it—the kid was weird. Elijah nodded and then immediately slowed to watch a butterfly. Piper blew the hair out of her eyes and stopped with her hands on her hips. “Elijah … ” She was about to traipse back and get him when she heard Zach use that voice he reserved only for making her life miserable. With a certain dread she turned to her older brother … and cringed. Cody Martin, the all-school heartthrob, walked just across the street. He was tall with deep blue eyes and a smile that literally made it hard for Piper to breathe. Of course he didn’t know her from Adam, or Eve, but that didn’t stop her from pulling up her sweatshirt hood or ducking further under her hair whenever he was around. Unfortunately, she had stupidly asked her brother about him when the two had played baseball together. And that was all the ammunition Zach needed. “Look who’s across the street,” he teased. Piper’s head snapped up to him. The only thing more startling than hearing him speak her name was the grin he flashed her before moving on. He had grinned .... at … her. Suddenly Piper’s hood was up, her hair was down … and her knees were just a little wobbly. It wasn’t until she heard Zach snicker that she came to earth and turned on him. “Is it your goal to be the jerkiest brother on the face of the planet?” She demanded. Elijah came to attention and ran toward them. That’s when Piper noticed the KWIT-TV news van heading up the street. Piper gave another sigh. What was God thinking when he made older brothers? Suddenly, she noticed a small Cocker Spaniel puppy running into the street in front of them. It was followed by a little girl, probably in kindergarten. Neither of them saw the car coming from the opposite direction. The little girl looked up but was too late. The car hit the brakes, tires screeching. Its right front wheel ran over the dog with a sickening K-Thump while the front bumper hit the little girl. It knocked her hard to the ground causing the back of her head to slam onto the concrete. Neither the girl nor the dog moved. The shaken driver opened his car door and slowly stepped out. The crossing guard, who had seen the whole thing, began running toward them. And the news van had jerked to a stop with the woman reporter now leaping out. “Get the camera rolling!” She called over her shoulder. “I’m on it!” the cameraman shouted just behind her. Piper glance around for her little brother, but he was no where to be found. She turned to Zach but he was too busy trying to get a look at the girl to pay attention. The news crew pushed past them for a closer shot. “Hey, check it out,” the reporter pointed. But she wasn’t pointing at the little girl. She had noticed something across the crowd and on the other side of the street. Piper followed her gaze to see … Elijah. He sat on the curb holding the dead puppy. But instead of crying, his lips quietly moved—almost like he was whispering to it. And then, to Piper’s astonishment, the puppy began to move. A little at first, but it soon began wiggling, squirming, and even lifting up its head to lick Elijah’s face. “Did you see that?” The reporter cried. “I’ve got it!” The cameraman shouted. “It’s like he healed it or something!” She exclaimed. With a grin, Elijah set the dog down. It began jumping and running around like it had never been hurt. The little boy looked up, grinning even bigger. “Excuse me!” the reporter shouted. They started to run, neither turning back. Judy Dawkins was struggling with the vacuum cleaner when her husband burst through the front door. He tried to smile, but something was up. The scene cut to an accident sight where a little girl was being loaded into an ambulance. The scene cut to a Cocker Spaniel lying if front of a car. Again the picture changed. This time a little boy sat on the curb holding the dog and whispering to it. Tears filled Mom’s eyes as she watched the dog suddenly sitting up in Elijah’s lap and then lick his face. Mom stared at the screen as Piper appeared and hurried Elijah away from the camera and toward the school. The report continued but Mom no longer heard. Tears blurred her eyes as her husband wrapped his arm around her. She tried to answer, but her throat was too tight with emotion. Monica Specter and her two male assistants sat in the dingy, cockroach-infested hotel staring at the same newscast. She looked at him another moment. Then, shaking her head, she disappeared into the other room. Silas, their skinny partner with a long, pointed nose, shut down his laptop. “You shouldn’t ask stupid questions like that,” he said to Bruno. Silas shrugged. He never liked talking about the head of their organization. To be honest, the man gave him the willies. On the Run is the first book I've read by Bill Myers. We do have a couple of his books on my sons bookshelf, but haven't read them yet. I'm glad I had the opportunity to read this one as a review. Piper, Zach, and their little brother Elijah seem like your typical siblings at first. They are walking to school like so many other kids do; Piper following her big brother, Zach and Elijah bringing up the rear seemingly in his own little world. Their walk to school is going to be different this day and it will change their lives forever. Elijah is seen on tv by everyone, including his parents. They know that him being seen on tv is about to make their lives extremely challenging. Mike and Judy immediately move into action. Unfortunately, there isn't enough time for the family to prepare together. This event sets us up for the rest of the story. I really thought this was a fun book. There were several times I laughed out loud as I read. The dynamics between Zach and Piper is hysterical at times. He plays the annoying big brother role very well. Their determination to work together shines through though. We end up having a couple support characters thrown in with the kids: Cody and William. They add a lot to the surrounding storyline. I hope they will be in the next books of the series. It's interesting the characters of the parents and bad guys remind me of Disney characters. The parents make me think of the parents in Spy Kids, although I don't know that they are actually spies. The bad guys (which includes a woman) remind me of the guys in Home Alone. So, you can imagine what they're like. The actual ring leader of the bad guys is called Shadow Man. Now, he is one creepy dude! This book would be great for pre-teens and teens looking for a quick read. Now, that doesn't mean it's boring, just short in length. It's action-packed from beginning to end and I really would love to read the rest of the series!